Adult Blue Ox Costume By: Fun Costumes for the 2015 Costume season. Let's face the facts. You already spend your days hanging a big lumberjack type character who hangs around in Minnesota, so you may as well be a big blue ox, right? Alright, so maybe that might not really describe your life, but how many times do you get to see a blue ox in nature? Not many, and you can bet if you ever do see a big blue ox in the wild, it's probably been experimenting with some kind of unnatural hair dye colors. 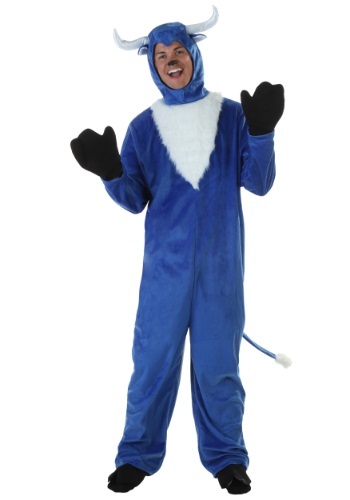 The only surefire way to see a blue ox in nature is to wear this costume and hang out on the open plains! That's where oxen live right?